I just got back from seeing the movie and I thought it was really good. To be honest, since I've been anticipating seeing it, and really looking forward to it, and being very excited about it, I was worried that it wouldn't meet my expectations. Luckily I thought it was really good. I will say, however, that it is an adventure movie. Ready for adventure? Everybody should know the story by now: Alice Kingsley is expected to marry an overbearing young man that she isn't really into, and when he proposes to her, she excuses herself and takes a side trip down the rabbit hole. But in doing so, Alice jumps out of the proverbial frying pan and into the fire. Once in Underland (Wonderland) again, she is pulled into an adventure where she is expected to do other things she'd really rather not do by some characters that she can barely understand. Like the books, everything works by its own logic (or illogic, as the case may be) and Alice plays the part of the "straight man" by being serious and sensible in the face of madness. The movie has its weak points. For example, I felt let down by the Tea Party. I was expecting something more like the book or the Tea Party in the 1952 Disney adaptation. Both are silly and maddening. While Burton pays homage to the 1952 Disney version by having the March Hare pour some tea "into" a tea cup with a broken bottom and some other nonsense like that, the Tea Party in this movie is squandered to provide some background information about current events in Underland. Both my guest and I felt let down by the Futterwacking, especially after so much had been made of it. I don't know about anybody else, but I also felt like the movie was "rushed" and could have used some more attention or time in some scenes. *Whew* OK that was a lot - let's look at the good things. 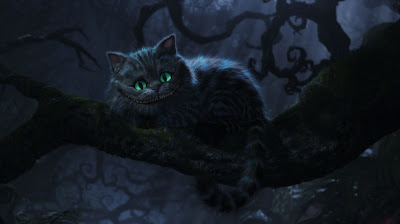 Things I really loved: The Cheshire Cat is amazingly cool, has mysterious dialogue, is an intriguing character, and is awesomely animated. The Bandersnatch is horrifying, sad, and (surprise) complex. Helena Bonham Carter is a hoot as the Red Queen, and Anne Hathaway totally hams up the prim fairy queenliness of the White Queen. Johnny Depp as the Mad Hatter is by turns tender, mad, sad, haunted, and crazy. There are also: talking animals, laboring monkeys, a horrifying moat crossing, a menacing performance by Crispin Glover, some white-knuckle bravery, some men acting like pigs, some emotional depth, and some arguments that end only when one of the parties involved manages to makes absolutely no sense. The architecture of the palaces is amazing. 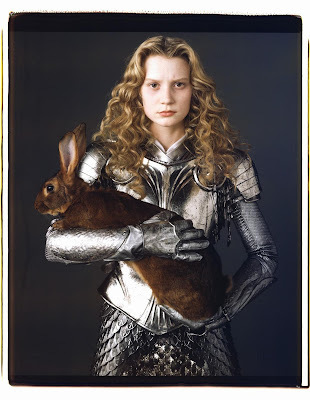 Alice rides several creatures in the movie and each time it is exhilarating. On a basic level, I think Tim Burton's movie is about a girl searching for her identity. Alice's identity is questioned at the very beginning by the Dormouse and other characters. At first Alice claims to be "The Alice" but then chickens out. When consulted about her identity, the Caterpillar says that she is "Not Yet Alice." Later in the movie, Alice deceives the Red Queen by claiming to be someone named "Um." All along, Alice is either too big or too small. It is as if she needs to get "right-sized." As the story unfolds, Alice finds herself walking the line between what she thinks is right and what everyone else in the story expects of her. I don't know how anyone else feels about it, but I liked this extra level of meaning, and I also liked the extremes that Alice has to traverse to find her own answers. As a bonus, Alice also gets to wear a bunch of beautiful and amazing dresses and outfits. Much kudos to costume designer Colleen Atwood for these and the other costumes in the film. Last, as everyone seems to agree, the 3D and animation is really amazing and Underland is dazzlingly cool and dark. If you're going to see Alice in Wonderland with the expectation that it will be everything you would expect a masterpiece based on Lewis Carroll's timeless books to be, you might come out disappointed. BUT if you're looking for a fun adventure about a girl who is trying to find herself, then you're in for a fun ride. What did you think? Leave a comment here or send in a review to alice@coldcold.com. I'll publish any reviews received on a special review page. If you have a blog and review the movie, drop me a line and I'll link to your review. Hooray! 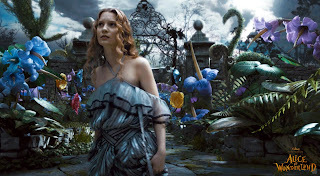 Tim Burton's amazingly bizarre 'Alice in Wonderland' helped snap me out of my 2010 movie doldrums.